1997 seems far too recent a time to put in the proper historical perspective when it comes to music, but the heart wants what it wants, and mine wants 1997. Part of the reason for that choice is surely how absolutely immersed I was during that period of time. I published/edited/lived a music fanzine called Milk from 1993-1999, during which time I was also dabbling in concert promotion (as “Milk Magazine Presents”). Oh, and did I mention that I was also manager/buyer at an indie record store—Atomic Records in Milwaukee—for that entire period? Yes, I was. So assuming I was awake for 16 hours a day—probably a low estimate—I was probably listening to music for 12. A nine-hour shift at the store with co-workers with wildly varying tastes and access to every record at all times left a pretty serious impression. I still listen to an inordinate amount of music, but I’ll probably never re-create the absolute immersion of those years. In the inaugural My Favorite Music Year, Steven Hyden wrote about a friend of his who didn’t listen to any music made before he was born. While I don’t think that’s valid—he’s cheating himself!—I would definitely have a tough time choosing a favorite music year that I didn’t actually live through. Which isn’t to say that context is more important than the music itself, but your age, state of mind, and life situation certainly play parts in how music affects you. And for me, it was mostly about the nascent world of indie-rock. Things were certainly becoming more segmented and rigid in the world of popular music at the time, with radio formats finding their way into stricter genres. Pop—the kind you find on the radio and the Billboard Singles chart—was going through a particularly fallow time: The year’s big singles included Jewel’s “You Were Meant For Me,” Third Eye Blind’s “Semi-Charmed Life,” and Sugar Ray’s “Fly” in the ubiquitous/insipid category. The Spice Girls’ Spice was the year’s best-selling album, but at least that provided a bit of tongue-in-cheek fun. The best-selling country album of all time, Shania Twain’s Come On Over, came out in 1997—it’s now platinum 20 times over—but none of those songs filtered their way into my existence much. “Indie” still existed on the margins: Even a band like Pavement, which seems so major in hindsight, was barely a blip compared to Puff Daddy, who was all over the charts. (One incredible anomaly: the anarcho-punks in Chumbawumba, who hit huge with the fantastic fluke “Tubthumping.”) Pop-punk was already firmly entrenched on the charts thanks to Green Day, who made it extra safe for the malls—Hot Topic really started booming in the late ’90s and never looked back. But there were a slate of records in 1997 that represented artistic peaks for some of the most influential independent (-minded or –labeled) musicians of the time. There wasn’t necessarily pressure for indie or underground bands to make mainstream records, because success on a grand scale just didn’t seem within the realm of possibility. Surely nobody would have guessed that Elliott Smith would end up on the Academy Awards stage, or that Modest Mouse would one day have a massive hit single, or that Neutral Milk Hotel would quietly sell more than a hundred thousand records after breaking up. No, these were acts that, in 1997, were still relatively unknown, with seemingly little hope of doing anything more than selling out thousand-seat clubs (Radiohead excepted, of course). Those relatively small goals may have resulted in a purer aesthetic. As different as my five favorites are, they share a spirit of independent authenticity. Enough ink has been spilled on Radiohead’s career high point to supply Bic pens to the third world for decades. It’s a powerful, moving record that you’ve probably heard by now. It’s interesting, though to remember its context in 1997. There was a time when Radiohead, believe it or not, wasn’t flush with indie-cred. (Not that they were looking for any, of course.) This was the band whose greatest exposure to the world was via “Creep,” a song at this point best left forgotten—from a debut album also best left forgotten. 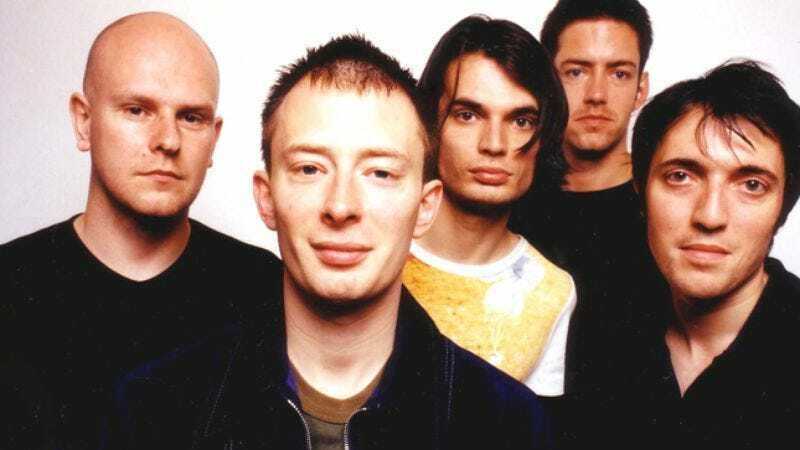 Radiohead got far more interesting as songwriters and soundsmiths with the powerhouse The Bends, but nothing prepared listeners for the audacious darkness of OK Computer. Fun fact: Americans got an early taste of some of these songs when Radiohead did a brief tour in the midst of recording OK Computer. They were opening for Alanis Morissette. On his way to slicker, more commercially successful times, Isaac Brock had an artistic breakthrough with The Lonesome Crowded West, a sprawling, messy, gorgeous distillation of his belligerent psyche. The world, strangely, seemed to respond: It’s easy to forget with the subsequent successes of The Moon And Antarctica and especially Good News For People Who Love Bad News, but West was an underground smash. And of course, sonically, its ripples were felt for years, both in Modest Mouse’s own mainstream success and in the bands that followed. I’ll freely admit that my own context—the band were hometown heroes for me—probably colors my good feelings about The Promise Ring’s 1997 classic, but I’m certainly not the only one who felt its impact. It was a curious time for “emo”—in 1997 the word had mutated away from its original intention and was slapped on this incredibly ebullient disc. It’s unquestionably the Milwaukee band’s greatest recording, with the energy of its popular ascent harnessed to a then-newfound sense of pop songcraft. It’s still a joy. Any discussion of music in 1997 should really include Belle And Sebastian’s classic second album If You’re Feeling Sinister. Though it was technically released in ’96, it didn’t find its way out of the UK until the following year. But perhaps this is a better place to champion the three EPs the Scottish band released in 1997—with many moments every bit as good as Sinister, they remain a less-heralded part of the band’s catalog by virtue of their length. But the 12 tracks spread over “Dog On Wheels,” “Lazy Line Painter Jane,” and “3,6,9 Seconds Of Light”—now collected on disc one of Push Barman To Open Old Wounds—perfectly encapsulate those early B&S years of fantastic self-consciousness. The Belle of today can be great, but it seems too different (and, if I have to choose, considerably inferior) to the bedroom confessionals of 1996 and 1997. Oh man, 1997 is full of “also,” many of which contributed to my decision. Spiritualized’s classic Ladies And Gentlemen We Are Floating In Space took the British band’s spacey rock to the next level. Mogwai released the career-defining Mogwai Young Team, setting the pace for massive sheets of instrumental-rock. In a similarly spooky vein, Canada’s mysterious Godspeed You Black Emperor released the first edition of f#a# on vinyl in 1997, complete with letterpressed sleeve and a commemorative Canadian penny. It would have a huge impact on a small segment of musicians the following year. Jonathan Fire*Eater went from next big thing to “whoops, nobody bought our major-label debut!” with Wolf Songs For Lambs, which deserves credit for a) being awesome and b) not sounding like a major-label debut. Another commercial flop, Catherine Wheel’s Adam And Eve, is ripe for a revisit: It’s the band’s best. Harvey Danger’s Where Have All The Merrymakers Gone came out on a micro-indie label in 1997 before the world discovered “Flagpole Sitta,” and the rest of the album is power-pop perfection. Smog delivered the sad-sack classic Red Apple Falls, which isn’t as good as Knock Knock, but is still essential. Speaking of sadsacks, I used to listen to Julie Doiron’s weepy Loneliest In The Morning from noon til night in 1997; if you like Joni Mitchell, give her a shot. Guided By Voices released their last wall-to-wall classic (sorry, Hyden), Mag Earwhig!, which includes “Bulldog Skin” and “I Am A Tree.” It goes on: Robert Wyatt’s Shleep, Jim O’Rourke’s Bad Timing, The Dismemberment Plan’s Is Terrified, Grandaddy’s Under The Western Freeway. Start with all of those! Phew. There are other places to read about Missy Elliot, Bob Dylan, and Daft Punk, too. A skinny white kid from Detroit released The Slim Shady EP in 1997, which started a whirlwind. It’s funny, because pretty much every song on the EP made it onto the breakthrough Slim Shady LP in 1998. Jeff Mangum, a.k.a. Neutral Milk Hotel, played plenty of shows in 1997, debuting material from his 1998 classic In The Aeroplane Over The Sea. Feel stupid that you stayed home instead of driving to Chicago to see NMH in May of ’97? Me too! 1994, you will go down as the golden age of pure indie-rock, with classic albums from Guided By Voices (Bee Thousand), Silver Jews (the genius Starlite Walker), Archers Of Loaf (Icky Mettle), and Sebadoh (Bakesale). You also brought us Beastie Boys’ Ill Communication and Beck’s Mellow Gold. And we all thought Tortoise had started a revolution with a self-titled disc of smooth-indie-jazz. Plus, also, too: Sunny Day Real Estate’s Diary, Portishead’s Dummy, Pulp’s His N Hers, and Aphex Twin’s Selected Ambient Works Volume II. You are crazy diverse, 1994, and that’s why I love you almost as much as I love 1997.